We recently completed an orangery for a Milton Keynes family who were delighted with the result. They were looking for a room for entertaining and where the family could spend time together. 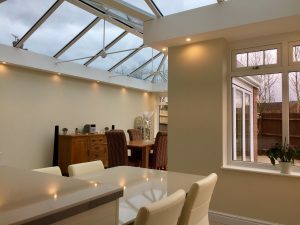 With the extra space and natural light it provides, an orangery was the right choice for this family. Having used Win-Dor before, they knew the quality of service they would receive. We used the same brickwork as the house to allow it to blend in and the glazed roof allows natural light to flood in. With built-in spotlights, this uPVC orangery has a stylish finish. It’s these bespoke touches that we like to add to make our extensions personalised for each family. 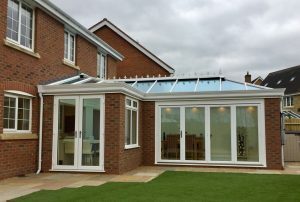 With a Pilkington Activ Blue glass roof; the orangery maintains a comfortable temperature all year round. It works by deflecting the sun’s rays to keep you cool in the summer. Heat is trapped in during the winter to make this an all seasons room. This glass also benefits from being self-cleaning so will stay looking this good with no effort needed. With underfloor heating also installed, this family will never need to worry about being cold again. If you would like to create a new space for your growing family, contact the helpful team at Win-Dor today.